Following the difficult ratification of the Maastricht Treaty (1992), the European Commission believed European citizens were suspicious of the secretive bureaucracy of the European institutions and desired more institutional transparency, easy access to official documents and opportunities to enter into debate and dialogue with the European institutions. In response, the European Commission started to publicly communicate a form of political-dialogical European citizenship in a ‘Europe of Transparency’. Here, European citizens were to be well-informed rational discussants deeply concerned with all forms and sorts of policy matters, and they debated increasingly using both physical and virtual spaces on different levels, namely on Community, national, regional and local levels. CCE (Commission des Communautés Européennes). (1998a). Internal market—Single market news. http://ec.europa.eu/internal_market/smn/smn11/s11mn04.htm. Accessed 5 June 2011. CVCE. (2012). Chronological table on transparency (1992–2004). http://www.cvce.eu/viewer/-/content/23f49e51-cebf-4f55-a581-f85292be1315/en. Accessed 2 Feb 2012. EP. (2004, October 6). Response to hearing of Wallström 2004 (AFCO (2004) D/41922). http://www.europarl.europa.eu/hearings/commission/2004_comm/pdf/lt_wallstrom_en.pdf. Accessed 5 Apr 2015. Ernst and Young. (2008). European Commission. DG Communication. Evaluation of the EUROPA website. http://europa.eu/survey/feb08/results/europa_final_report_executive_summary_en.pdf. Accessed 16 Feb 2012. European Union. (no date). The European flag. http://europa.eu/about-eu/basic-information/symbols/flag/index_en.htm. Accessed 22 Jan 2012. Moravcsik, A. (2005). Europe without illusions: A category mistake. Prospect, Issue 112, July. http://www.prospect-magazine.co.uk/article_details.php?id=6939. Accessed 12 Mar 2010. Scharpf, F. (2000a). Notes toward a theory of multilevel governing in Europe, MPIfG Discussion Paper 00/5. http://www.mpifg.de/pu/mpifg_dp/dp00-5.pdf. Accessed 12 Mar 2010. Scharpf, F. (2000b). 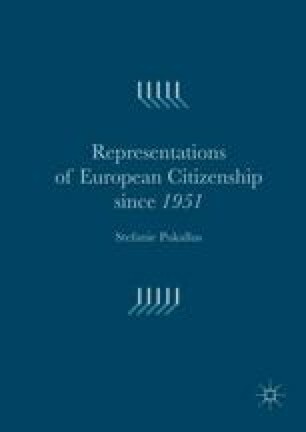 The European democratic deficit: Contested definitions or diverse domains? European Union Studies Association, 17(1). http://www.eustudies.org/files/eusa_review/Winter2004Review.pdf. Accessed 2 Mar 2010. Scharpf, F. (2007). Reflections on multilevel legitimacy (MPIfG Working Paper 07/3). http://edoc.vifapol.de/opus/volltexte/2007/84/pdf/wp07_3.pdf. Accessed 23 Mar 2010. Schmidt, V. A. (2015). The forgotten problem of democratic legitimacy. In M. Matthijs, & M. Blythe (Eds. ), The future of the Euro. Oxford: Oxford University Press. http://www.cis.ethz.ch/content/dam/ethz/special-interest/gess/cis/cis-dam/News_Events/Events_2014/2014_CIS_Colloquium/2014_FS/Schmidt_Legitimacy.pdf. Van Bijsterveld, S. (2004). Transparency in the European Union: A crucial link in shaping the new social contract between the citizen and the EU. https://www.ip-rs.si/fileadmin/user_upload/Pdf/clanki/Agenda__Bijsterveld-Paper.pdf. Accessed 13 July 2012.